For the past years, LHU students have consecutively received study abroad scholarships and been offered jobs by multinational companies. This has confirmed the growing prestige of the University. DSc Lam Thanh Hien - Vice Rector of LHU said last July, four senior students of Oriental Studies Faculty were introduced to Vietnam SHIBUTANI Co., Ltd in Long Duc Industrial Park. (Long Thanh district) to get training in Japan. Tran Manh Phi (left) and Nguyen Huu Phuoc at the dormitory in Kansai Region, Japan. Before they were students of LHU, they came from many regions with different learning conditions such as Tran Manh Phi (former student of class 12C12, Phan Boi Chau High school, Binh Thuan province), Nguyen Thi Tuyet Trinh (former student of Nguyen Truong To High school, Vinh city), Nguyen Huu Phuoc (former student of class 12A2, Chu Van An High school, Bien Hoa city) and Luu Gia Linh (former student of class 12C203, Le Quy Don High school, Bien Hoa city). But when they entered LHU, they were given opportunities to study in the best environment and develop in advanced countries. For these students, after completing the study program in Japan, they have the choice to continue to work in Japan, or return Vietnam to work for companies. After more than a month, Nguyen Thi Tuyet Trinh, Nguyen Huu Phuoc, Tran Manh Phi and Luu Gia Linh have stably learned in the Kansai Region of Japan. They said living and studying environment in Kansai was very interesting and useful. Everyday they came to the factory and got experience in management, production and operation processes from Japan's experts, especially the opportunity to improve Japanese. At the weekend, they were taken to visit and learn about many places. "I was born in Binh Thuan province, my father died early. Going to university was my dream, also my mom's expectation. I was admitted to the LHU Faculty of Oriental Studies, Japanese Studies major. Luckily when I was a last year student, I was introduced to Japan to study with my friends." shared Tran Manh Phi from Japan. Phi also added: "... Difficult circumstance, so going to Japan to study is a little dare to think. All the costs of studying in Japan are covered by the company, after finishing my study, I want to stay here for at least 3 more years, and then I will return Vietnam to settle my job, take care of my family and my mother. " The landscape of Kansai region of Japan where LHU students are studying. While Nguyen Huu Phuoc is the only son of a family in Quyet Thang ward, Bien Hoa city. 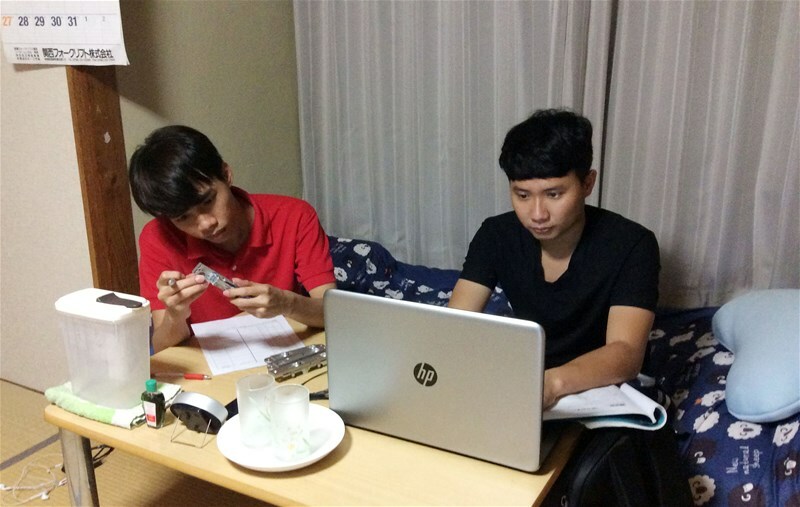 Phuoc decided to stop studying at HCM City University of Industry to transfer to Japanese Studies major of Faculty of Oriental Studies, LHU. When Phuoc was the fourth year student, he was trained in Japan. "Since I am the only son, so when I went to Japan, my mom was so worried. But now, everything is fine. I was thoroughly communicated knowledge of management and training of honesty, working hard." said Phuoc. According to LHU students studying in Japan, learning Japanese language is one of the good choices since there are more and more Japan companies investing in Vietnam in general and Dong Nai in particular. They also need Vietnamese workers to work in Japan. Japan enterprises always pay laborers in Vietnam highly. Ms. Tran Minh Thuy Duong, lecturer of Oriental Studies Faculty, LHU shared "I was a former student of LHU. Since I had good academic results, I was retained as a teaching assistant, and then I received scholarship of the Japan Government and then return home to teach here. I am delighted that besides Japanese Studies major, Chinese and Korean Studies majors have students receiving scholarships to study abroad. " In Dong Nai, there are 31 industrial zones with 1,200 foreign invested enterprises. Particularly, Japanese enterprise has owned one industrial zone as Long Duc Industrial Zone. In addition, many industrial zones in Nhon Trach district have been filled by high-tech enterprises of Japan. This is a fertile ground for students with knowledge and skills in Japanese language. According to statistics of LHU International Relations Department, there are nearly 100 students receiving scholarships to study abroad and attend graduate programs in Japan and some countries. Recently, two students of LHU have been offered jobs by two companies from Germany and Singapore, respectively.